Preheat oven to 425 degrees. 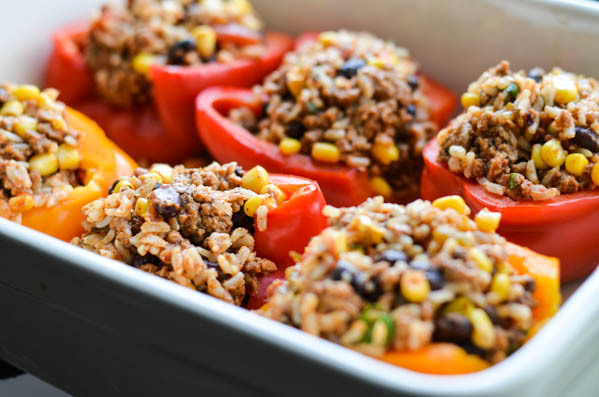 Arrange peppers in a 9×13 baking dish and roast for 15 minutes. Meanwhile, bring 1 cup brown rice to boil with 1 and 1/2 cups water in a saucepan over high heat. Cover pot and simmer for 10-12 minutes. In a large mixing bowl, combine salsa, cooked ground turkey, rice, black beans, corn, garlic, and mexican seasoning. Stuff roasted peppers with filling. Roast stuffed peppers covered with aluminum foil for 15 minutes. Remove foil and sprinkle tops with cheddar. Roast for 5 more minutes. Top with cilantro and green onion. Roast covered with aluminum foil for 15 minutes. Remove foil and sprinkle tops with cheddar. Roast for 5 more minutes. Top with green onions and cilantro. 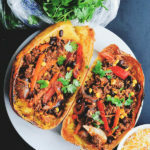 Arrange peppers in a 9x13 baking dish and roast for 15 minutes. Meanwhile, bring 1 cup brown rice to boil with 1 and ½ cups water in a saucepan over high heat. Cover pot and simmer for 10-12 minutes. 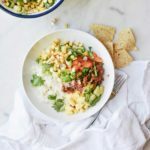 In a large mixing bowl, combine salsa, cooked ground turkey, rice, black beans, corn, garlic, and mexican seasoning. Stuff roasted peppers with filling. Roast stuffed peppers covered with aluminum foil for 15 minutes. Remove foil and sprinkle tops with cheddar. Roast for 5 more minutes. Top with cilantro and green onion. What would be a good salsa to use? Like a chuncky fresh made salsa? Or store jar bought? This is a regular in our dinner rotation. Sometimes I substitute quinoa for the rice and it’s great. What is the serving size? It calls for 4 bell peppers, but says it serves 5-6….so, less than one stuffed pepper per serving? The pepper are cut in half. So it would serve five to six with each person eating 1-2 of the peppers as pictured. When you cut a pepper in half it will make 8 stuffed peppers. 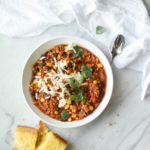 Do you need to drain the corn & black beans? Do you have to roast the peppers first? Oh My, I just made these, minus tomatoes, and instead of the bean, corn and spices separate, i bought a pre-made pack of chipotle beans and corn from Fred Meyer and dropped that in! AMAZING, thank you! I loved this recipe the last time I made it. I came believe more people didn’t comment on it. 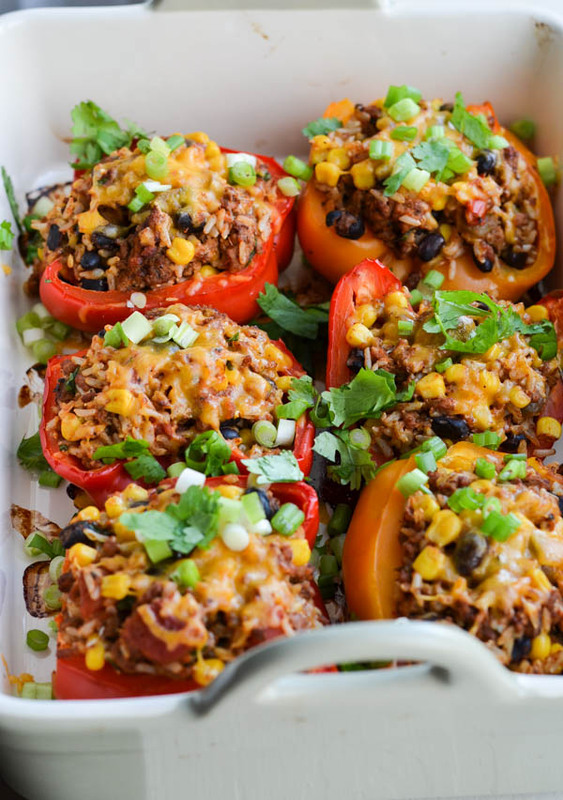 It is a great twist on regular stuffed peppers. Plus the tip to cook lengthwise is amazing. Such a small change but it really improves the dish. Seriously this post deserves more appreciation. I have always wanted to try stuffed peppers, but some of the recipes just seemed to ‘not for our family’. 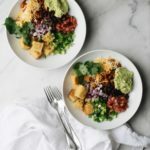 We love Mexican foods and this recipe is some of the flavors we love too! So I tried. I only had lean ground been not the turkey ,smoky chipotle cheddar cheese, and also cooked in a small casserole in a toaster oven to keep house cooler in summer. I I did have to cook to dishes but hey we will eat them for leftovers or have for lunch. Thanks for the recipe! It is cooling now!